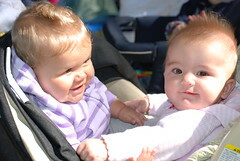 Violet and her neighbor Lily are six-and-a-half months old already. They're almost at the age (seven months) where they're still babies, while no longer being "new babies". It's a great age. Violet can almost sit up, but she still doesn't move around much. She grabs for things, but can't really destroy anything yet. She makes cute noises and is usually quite happy, maybe because she's still not teething. And her diapers are big enough to hold her once-every-other-day poop without leaking. She's good at going out, she smiles at strangers, she loves her stroller, she falls asleep easily in her car seat. She's never been sick. She's getting better at eating from a spoon. And she always sleeps nine to eleven hours a night. Plus, she's still adorable. "Perhaps we were blessed with an unusually good baby, but so far this parenting thing has been way easier than I had been led to believe it would be." I felt like the parenting thing was much harder than I expected, when Iris was a baby. She was moving around then, and we were moving into a new house. With the constant nursing, I was just exhausted at that point. She didn't grow to like her carseat until about 20 months, when she started to make the connection of car trip = going somewhere probably new and probably fun. There were full nights of sleep around 3-4 months, but they've been a rarity since then. But, I think toddlerhood has been WAY easier and more fun. She eats, she rides in the car or bus, she likes the stroller, she understands things, she loves books, she plays on her own, she's occasionally helpful, she walks well and doesn't try to run out into the street, she doesn't nurse at nights, she plays fairly well with other kids, etc. So many upgrades! Teething has been rough, but we're in a lull right now. Helen seems to be a good one too. Though she did keep me up too late in those early months.